Homer Harris was born on March 4, 1916 in Seattle, Washington. 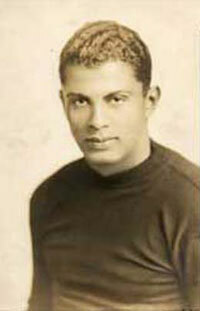 In 1933, Harris became the first black captain of the football team at Garfield High School in Seattle. At the University of Iowa, Homer was elected by his teammates to be team captain, most inspirational, and Most Valuable Player. He was the first African American team captain in Big Ten history and had hopes of becoming a player in the National Football League. In 1933, the National Football League banned African Americans from playing, so upon graduation Harris instead accepted a coaching job at A & T College in Greensboro, North Carolina. His mother’s influence caused him to enter medical school at Meharry Medical College in Nashville, Tennessee. Harris joined the Army, and after World War II had an internship in dermatology at the University of Illinois. Harris returned to Seattle in 1955 and opened his own dermatology practice. After initial difficulty renting office space in the Medical Dental Building, Harris built up his practice which was reputed to be the largest west of the Rockies. Harris received an award in 1989 from the Black Heritage Society for being a black pioneer in dermatology. He retired from practicing medicine after 43 years. Washington State declared November 13, 2002 to be Dr. Homer Harris Day, and the Seattle Parks Foundation announced that an anonymous donor contributed $1.3 million to build a park in Seattle’s Central Area in Harris’ honor. The University of Iowa inducted Harris into their Hall of Fame in August 2002, and the Pacific Northwest chapter of the African American Sports Hall of Fame followed suit in 2003. Homer Harris Park opened on May 14, 2005. Homer Harris died in Seattle on March 17, 2007, at age 90 from Alzheimer’s disease.